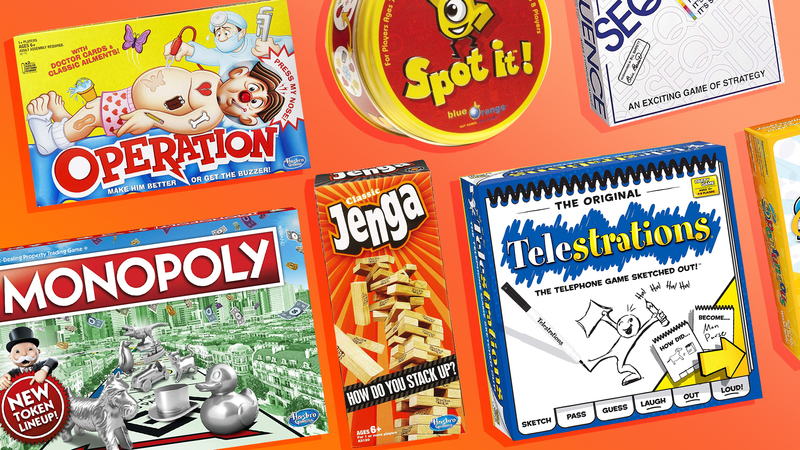 If you’re anything like us, the return of spring (and therefore the promise of summer soon after) signals the perfect time of the year for family board games. For starters, when the kids are out of school on break, you’re gonna need something to keep them entertained. But mostly, longer days mean even more of an opportunity to while away warm evenings playing board games with your family. The laughter, the fun, the tiny figurines — it’s one of the most enjoyable pastimes there is. Pinpointing the perfect board game to play with your family can feel daunting, though. There are the classics most of us are well aware of, yes. But roughly one bazillion new games have popped up in the last five years alone. How’s a mama supposed to know which games to go for and which game to steer clear of? We’ll tell you how. As in, literally, we’re going to tell you which family board games are the best and which are for the birds. Take note, because marathon gaming sessions should be in your family’s near future. What is it about being on edge that is so darn fun? There’s something entirely addictive about the way suspense builds every time someone’s fingers grip a precariously positioned wooden block. Plus, kids as young as six can play, so it’s good, clean fun for the whole fam. Who doesn’t love a game that encourages you to randomly shout things out? You see, between any two cards, there is only one matching symbol. So, whoever spots it first gets to holler it out. While we have no actual scientific proof, we feel positive that the use of visual perception and speech-language used must boast benefits for growing brains. Here’s the first thing you should know about Grandpa Beck’s Cover Your Assets: It was created by a family sitting around the kitchen table having fun together. That’s good juju, no? On top of that, the game is a raucous good time that involves stealing assets, hiding assets and just generally one-upping your family members. What makes this a great choice for families? A few things. Like, for example, players can be as young as seven. Or the fact that up to 12 players can participate, making it ideal for big broods. And, finally, it’s both simple enough for younger siblings and challenging enough for more mature family members — it just involves playing a card from your hand, placing a chip on a corresponding space on the board and working to score five-card sequences. If the game “telephone” and Pictionary had a love child, it would be the always hilarious Telestrations. Everyone gets their own erasable sketchbook, on which they draw out secret words. Then, everyone passes their book to the left, and the player who now has it must try to guess what it is. And so on until the sketchbook is back in the hands of its original owner, who reveals how hilariously off-base the guesses were. It’s addictive! When Kristen Bell and Dax Shepard sing the praises of a game, you know it must be good. Such is true for Catan, a game in which your adventurous settlers seek to tame the wild but rich isle of Catan. It’s best played with kids aged 10 and up, but it’s never too early to let your little ones sit in and become wise to the ways of Catan. OK, parents — whether or not you’re comfortable with your kiddos playing this one is a total judgment call. Although the game says it’s good for ages eight and up, it does operate under a somewhat scary premise involving a pandemic of four diseases threatening to wipe out mankind. However, if you think that won’t creep out your kids, the reward is a super-fun and exciting mission to find cures which might eradicate the diseases before it’s too late. You can’t go wrong with this classic! Sure, it’s not quite as flashy as some of the newer games on the market, but it seriously never gets old. Besides, there’s something to be said for spending an evening trying to out-word everyone you love. While some people will swear by classic Monopoly, there are those among us whose kids simply won’t sit through an epic session of the original. But this video game-inspired version? Fun for everyone since (a) it has brevity on its side and (b) you get to play beloved characters like Princess Peach and Yoshi. It’s just fact that when people put something on their forehead, whatever they are doing is funnier. Fact! And this game is living proof. Anyone six and up can play, so round up the whole family for a guessing game that is sure to keep you in stitches. We hate to play favorites, but… Spontuneous is the best. It involves flexing the seemingly useless but impressive database of music in your mind. One player says a word, and then everyone else has to rack their brains to try to find a song containing that word — which they must sing. Can you say encore? We may be biased since we’ve been playing this in our own families for roughly for-ever, but Scattergories is one of those games that everyone seems to enjoy. It seems easy enough — you’re given a list of categories, and you must come up with an answer to fit those categories. But here’s the catch: All of your answers have to start with whatever letter you roll on the dice. You can play in teams too, making it easier for little ones to contribute in a way that isn’t overwhelming for them. Listen, we want to love this game. We do. But it couldn’t have been a parent of young children who invented it, because this beast has a ton of tiny parts that must be assembled before you can even start playing (every time). And spoiler alert? With the games target demographic of tiny humans around, it’s practically impossible to keep track of all the parts. Once you lose one, the game is rendered useless. Hard pass. Most of us grew up playing this, so our nostalgia tells us it must have been super-fun. In real life, though, the constant buzzing will fray your nerves — and it will be constant, because those tiny bones are tough little suckers to get out of the patient’s little wounds. Not to mention that, just like Mouse Trap, it’s way too easy to misplace all those teensy pieces. If you’re a diehard Monopoly fan, you might be scoffing right now. But hear us out. This list is about the best board games for families, and there are generally always at least one or two people in the fam who find this real estate themed game to be a bit dull. And let’s not even mention how it almost always turns into a family feud. Do you ever just stare at something and think, “What has the world come to?” That essentially sums up the sentiment with Flushin’ Frenzy. No kidding; it’s a game where you take turns plunging a toilet in the hopes that a poop won’t pop out. Y-U-C-K.
Again with the poop, oy! At least with this game, it’s pretty unicorn poop (file that under things you never thought you’d say), but still. Why are we playing games where the entire point is trying not to step in a steaming pile of poo? Granted, little kids will probably find it utterly hilarious. In full disclosure, it’s not that we don’t enjoy a mysterious round of Clue. However, playing it now in adulthood, we’re inclined to wonder how our parents ever encouraged us to spend hours with a board game all about murder. If your kids are almost grown, go for it. But leave the little ones out of figuring out who was clubbed in the study with a candleholder.